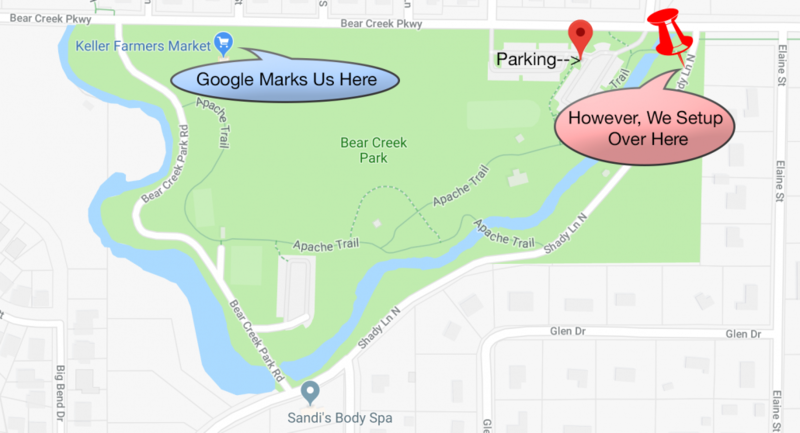 The Keller Farmers Market is located near the creek at the beautiful Bear Creek Park, which is at 400 Bear Creek Parkway. We are open every Saturday, May through November, 9:00 a.m. to 1:00 p.m.
We will still be open unless it is threatening weather. Some of our vendors may not come out in the rain, but the market will be open. Do you accept EBT cards? Yes! We accept SNAP and the Lone Star Card. Visit the KFM information booth to redeem benefits for scrip to be used at the market. Learn more. Is there a nearby cash machine? Yes. Keller has many banks and convenient stores nearby if you choose to use cash. Please note that all vendors at the market accept credit cards. All vendors accept credit cards and, if using cash prefer small bills. The market’s focus is local food. The producers’ growing practices vary. Some vendors do have farming practices that are chemical-free and pesticide-free, commonly known as naturally grown or possibly USDA certified organic. We encourage you to talk with each vendor to learn about their farming practices. See our produce availability page. No. In Texas, it can only be sold on the farm where it was produced. Is the market operated by the city of Keller? No. We are a nonprofit 501(c)(3) organization with our own budget governed by a board of directors and managed by an executive director. Bear Creek Park is a pet friendly environment where dogs can be walked on a leash. To volunteer your time at or for the market, visit our volunteer page.